Elmer was born in the Sunnyside area of Coeur d'Alene to Elmer James Currie and Pearl Edith (Esgate) Currie on February 13, 1920. He passed away on a beautiful sunny morning at the Schneidmiller House with his wife, Bernadine at his side in the presence of his children. Elmer embodied the word "tough", yet he was so gentle, kind, humble, and the epitome of "The Greatest Generation". At 11, he was working the fields and breaking horses in Canada with his father. In 1936, at the age of 16, Elmer moved back to the states. For the first few years Elmer worked in the Civilian Conservation Corps (CCC's) out of Coeur d'Alene. He would often joke that he designed and built a bridge which his buddies named Elmer's Bridge. In his late teens and into his early 20's, Elmer worked deep in the silver mines, such as the Midnight Mine, Sunshine Mine, and Lucky Friday Mine in Shoshone County. In 1941, he married the love of his life, Bernadine Bucher in Saltese, Montana and during their first year of marriage, they lived in Mullan, Idaho. Later they moved to Coeur d'Alene to start a family while Elmer worked at the Farragut Naval Training Station. In 1944, Elmer was called to duty. He enlisted and served in the US Marine Corps during World War II to fight for his beloved country. He spent a great deal of time stationed in the Philippines and on islands such as Chichi Jima and Iwo Jima. During his time in the Marines, Elmer was the undefeated boxing champion in the Marine Corps 3rd Division. He was honorably discharged on December 20, 1946, and was an active member of the VFW Post 889. Upon his return, he began to work as a carpenter and general contractor. During the late 1950's and through 1960's, Elmer was the owner and operator of Currie's Building Supply and Feed Store in Post Falls, Idaho. The store was owned and operated by the family for roughly 15 years. In 1974, Elmer ran for County Commissioner for District 2, Kootenai County, and served until 1978. Elmer never shied away from providing for his family, and always enjoyed being active. In the late 1980's, Elmer started a side business that was named Elmer's Wood Lot. The business started with a cord of wood and later grew into a prosperous endeavor. Elmer always had what many could have called a "Midas touch". Elmer enjoyed horseshoe pitching and often promoted tournaments and encouraged people to join in and play. In 1982, Pacific Northwest Pitchers Association named him "Mr. Horseshoe". In 2014, Elmer was inducted into the Idaho State Horseshoe Pitching Hall of Fame. Elmer also had the honor of having sanctioned tournament named after him, the "Elmer Currie Classic". These accomplishments are only a glimpse into the man he was. He was honest and true, and had a way of looking at you that would pierce right through your soul, so much so that you couldn't look away. The honesty he gave was the same he expected in return. His sense of humor was unparalleled, which kept him grounded as he raised seven children. He was devoted to the love of his life through 77 years of marriage and held her hand every night as they laid down to sleep…right up until the end. The things that mattered most to him were his family, his country, and a "good deal" - but most of all his beloved wife, Bernie. As tough as he was, he knew she ruled the roost. Elmer was a remarkable man and we were blessed to have had him in our lives. We were honored to have shared him with so many others over the years. Elmer was preceded in death by both of his parents, his brothers; Roy and Ralph Currie, and sister, Vivian Heaton. He is survived by his wife, Bernadine (Bernie) of 77 years, his seven children: Ted (Vickie) Currie of Dallas, Texas; Beverly (Bruce) Oliver of Post Falls, Idaho; Rick (Vicki) Currie of Coeur d'Alene, Idaho; David Currie of Post Falls, Idaho; Holly (Lynn) Roberts of Floyd, Virginia; Tammy (Roger) Farkes of Edmonton, Alberta; and Tori Currie of Coeur d'Alene, Idaho, 20 grandchildren; 20 great-grandchildren, and several nieces and nephews. The family would like to give a special thanks to the wonderful staff at the Schneidmiller House, and a very special thank you for the kindness of Kay McGruder. 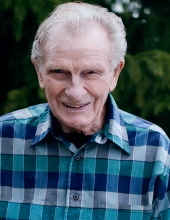 A memorial service celebrating the life of Elmer Albert Currie will be forthcoming at a later date. To send flowers or a remembrance gift to the family of Elmer Albert Currie, please visit our Tribute Store. "Email Address" would like to share the life celebration of Elmer Albert Currie. Click on the "link" to go to share a favorite memory or leave a condolence message for the family.